I really hadn't planned to venture downtown today because I quite expected to be run down by crazed last minute shoppers. But then I decided to stock up on my essentials for the holidays (books, in case you were wondering) and to do that I had to visit the central library. I admit that this is some kind of panic shopping of its own. Only that I didn't have to pay for my loot. After leaving the library I walked down the Zeil, our main shopping street, where I found myself pleasantly surprised that no stampede was happening, on the contrary, most people were calmly and friendly going about their business. I noticed three people taking a selfie, two of them obviously good friends and the third a rather excentric looking guy. This picture is from when I was in London for the very first time - it must have been somewhere around the mid eighties ... and the guy I noticed today could have been this beautiful young boy with the blonde mohawk, only years and years of a not exactly smooth life down the road. 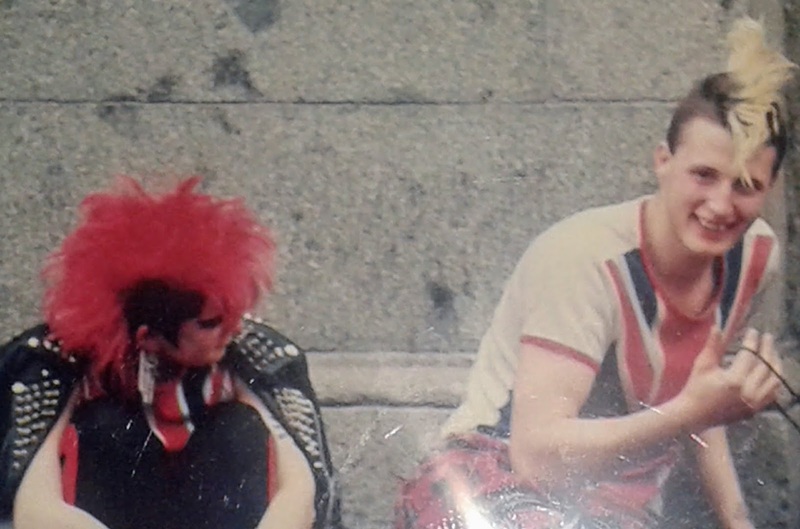 This senior punk had styled the four spikes of his hair to resemble the four candles of the advent wreath, in a brilliant red with the points in gold. And he wore his punk gear with a certain dignity, mind you, his jacket was the real thing with the whole shebang, from safety needles to tattoos and studs, not some fake wannabe biker jacket. I couldn't help but smile and compliment him for his outfit, and so we talked for a while. He asked, "How did you know I was English, luv?!" He was indeed from London, and visiting Frankfurt to see his daughter. When he told me about her, and about not getting along with her mother, his expression completely changed - I had originally wanted to ask him for a photo but all of a sudden he looked so vulnerable. I told him that he seemed a little sorrowful, and he just nodded. And so after we had shared some jokes and good wishes, we now also shared some tears. When we embraced I could smell a faint trace of alcohol and the leather from his jacket but mostly it felt warm and strong and exactly right. We wished each other a merry Christmas and a happy new year, then we parted ways, and I went home with a smile on my face. Even if a little sad one.